Home » Play » What a deal! What a find! 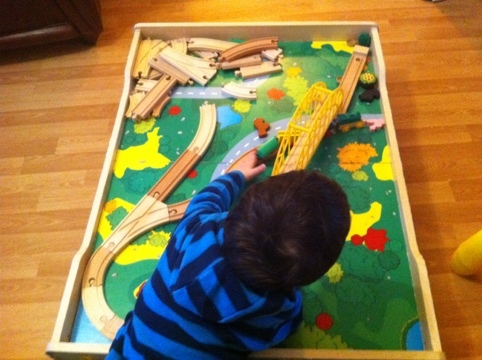 Still on the subject of trains, Charlie managed to pick up a wooden train play table and a set of tracks including a few bridges and some useful connectors – and the best part was, he got it for free! Someone advertised online that they were giving it away, and so we jumped at the chance to get it. It’s the perfect size to house our collection of wooden tracks, and it rolls away under the bed in Little Man’s room. Assuming he’ll stop playing with it long enough for us to put it away that is!